ବେସାନ୍ତ ନିଜ ବାଳରେ ଏକ ଲାଲ୍ ରିବନ୍ ବାନ୍ଧି ସଭାରେ ବକ୍ତୃତା ଦେଇଥିଲେ । କୌଣସି ଶିଶୁ ଭୋକିଲା ରହିବେ ନାହିଁ ବୋଲି ସେ ଘୋଷଣା କରିଥିଲେ । ସେ ନିଜର ସମାଜବାଦୀ ସିଦ୍ଧାନ୍ତ ଏବଂ ନାରୀବାଦକୁ ଏକତ୍ର କରି ଖିଥିଲେ: "ମୁଁ ନିର୍ବାଚକ ମାନ‌ଙ୍କୁ ମୋ ସପକ୍ଷରେ ମତ ଦାନ କରିବାକୁ କୁହେ ଏବଂ ଅଣ-ନିର୍ବାଚକ ମାନ‌ଙ୍କୁ ମୋ ପାଇଁ କାମ କରିବାକୁ କୁହେ । କାରଣ ବୋର୍ଡ଼୍‌ରେ ମହିଳା ମାନ‌ଙ୍କର ଆବଶ୍ୟକତା ଅଛି ଏବଂ ଏଠାରେ ମହିଳା ପ୍ରାର୍ଥୀ ମାନ‌ଙ୍କ ସଂଖ୍ୟା ଖୁବ୍ କମ୍ ।" Tower Hamletsଠାରେ ବେସାନ୍ତ ୧୫,୦୦୦ ଠାରୁ ମଧ୍ୟ ଅଧିକ ଭୋଟ୍ ପାଇ ସଂଖ୍ୟା ଗରିଷ୍ଠତା ଲାଭ କରିଥିଲେ । ସେ ତାଙ୍କର National Reformer ଖବର କାଗଜରେ ଲେଖିଥିଲେ: "ଦଶ ବର୍ଷ ତଳେ, ଏକ ନିଷ୍ଠୁର ଆଇନ ବଳରେ, ଜଣେ ଖ୍ରୀଷ୍ଟିୟାନ୍ ହଠୀ ମୋ ଠାରୁ ମୋର ଛୋଟ ଛୋଟ ପିଲା ମାନ‌ଙ୍କୁ ଛଡ଼ାଇ ନେଇଥିଲା । ଆଜି ଲଣ୍ଡନର ୭୬୩,୬୮୦ ପିଲାଙ୍କର ରକ୍ଷଣା-ବେକ୍ଷଣର ଦାୟିତ୍ୱ ମୋ ହାତରେ ।"
ପ୍ରମୁଖ ପାଦ୍ରୀ ତ‌ଥା ପ୍ରସିଦ୍ଧ ଖ୍ରୀଷ୍ଟିୟାନ୍ ଧର୍ମ ଗୁରୁ ମାନେ ଅନେକ ଶତାବ୍ଦୀ ଧରି ନାରୀକୁ ଧର୍ମ ମାର୍ଗରେ ବାଧକ ବୋଲି କ‌ହି ଆସୁଥିଲେ। ବେସାନ୍ତ ଏହାକୁ ଦୃଢ଼ତାର ସ‌ହ ଖଣ୍ଡନ କରିଥିଲେ। ସେ ନିଜ ଆତ୍ମଜୀବନୀରେ ଲେଖିଛନ୍ତି, "ମୃତ୍ୟୁ ପରବର୍ତ୍ତୀ ଦଣ୍ଡ ଓ ପ୍ରାୟଶ୍ଚିତ ତ‌ଥା ମହାନ ବାଇବେଲର ସତ୍ୟତା ବିରୁଦ୍ଧରେ ଯାଇ ମୁଁ ମୋ ମସ୍ତିଷ୍କ ଏବଂ ଜିଭର ସମସ୍ତ ଶକ୍ତି ଏକତ୍ରିତ କରି ଖ୍ରୀଷ୍ଟିୟାନ୍ ଧର୍ମର କ୍ରୁରତା ଏବଂ ଦମନ ନୀତି ବିରୁଦ୍ଧରେ ଠିଆ ହେଉଛି।"
(D.) That before about A.D. 180 there is no trace of FOUR gospels among the Christians....As it is not pretended by any that there is any mention of four Gospels before the time of Irenaeus, excepting this "harmony," pleaded by some as dated about A.D. 170 and by others as between 170 and 180, it would be sheer waste of time and space to prove further a point admitted on all hands. This step of our argument is, then on solid and unassailable ground —That before about A.D. 180 there is no trace of FOUR gospels among the Christians. (E.) That, before that date, Matthew, Mark, Luke, and John, are not selected as the four evangelists. This position necessarily follows from the preceding one [D.], since four evangelists could not be selected until four Gospels were recognised. Here, again, Dr. Giles supports the argument we are building up. He says: "Justin Martyr never once mentions by name the evangelists Matthew, Mark, Luke, and John. This circumstance is of great importance; for those who assert that our four canonical Gospels are contemporary records of our Saviour's ministry, ascribe them to Matthew, Mark, Luke, and John, and to no other writers." ↑ "History and Development of the Board". http://www.hsncb.com. ↑ ୪.୦ ୪.୧ Anne Taylor, 'Besant , Annie (1847–1933)', Oxford Dictionary of National Biography, Oxford University Press, 2004; online edn, Jan 2008 accessed 30 March 2015. ↑ Annie Besant: An Autobiography, London, 1885, chapter 4. 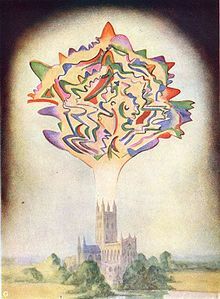 ↑ Annie Besant: an Autobiography (Unwin, 1908), 81. ↑ Annie Besant: An Autobiography, London, 1885, chapter 5. ↑ "The History of Birkbeck". Birkbeck, University of London. Archived from the original on 6 October 2006. Retrieved 26 November 2006. ↑ MacKillop, I. D. (1986) The British Ethical Societies, Cambridge University Press, [online] Available from: http://books.google.com/books?id=mqgsFS_MN9UC&pgis=1 (Accessed 13 May 2014). 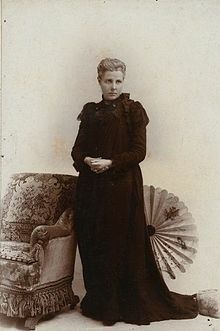 ↑ Annie Besant, Autobiographical Sketches (Freethought Publishing, 1885 ), 116. ↑ Edward R. Pease, The History of the Fabian Society (E. P. Dutton, 1916, rpt Aware Journalism, 2014), 62. ↑ Theresa Notare, A Revolution in Christian Morals: Lambeth 1930-Resolution #15. ↑ Sally Peters, Bernard Shaw: The Ascent of the Superman (Yale University, 1996), 94. ↑ Kumar, Raj, Annie Besant's Rise to Power in Indian Politics, 1914–1917 (Concept Publishing, 1981), 36. ↑ Edward R. Pease, The History of the Fabian Society (E. P. Dutton, 1916, rpt Aware Journalism, 2014), 179. ↑ Jyoti Chandra, Annie Besant: from theosophy to nationalism (K.K. Publications, 2001), 17. ↑ Margaret Cole, The Story of Fabian Socialism (Stanford University, 1961), 34. ↑ ୨୦.୦ ୨୦.୧ Mark Bevir, The Making of British Socialism (Princeton University, 2011 ), 202. ↑ Annie Besant, Annie Besant: an Autobiography (Unwin 1908), 330, 338, 340, 344, 357. ↑ Emmett A. Greenwalt, The Point Loma Community in California, 1897–1942: A Theosophical Experiment (University of California, 1955), 10. ↑ Kumari Jayawardena, The White Woman's Other Burden (Routledge, 1995, 62. ↑ Charles Webster Leadbeater 1854–1934: A Biographical Study, by Gregory John Tillett, 2008. ↑ Besant, Annie (2 June 1913). 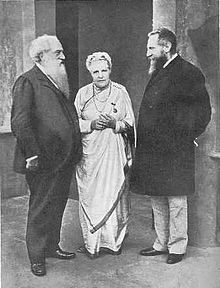 ↑ Blavatsky and Olcott had become Buddhists in Sri Lanka, and promoted Buddhist revival on the subcontinent. ↑ M. K. Singh, Encyclopaedia Of Indian War Of Independence (1857–1947) (Anmol Publications, 2009) 118. ↑ Kumari Jayawardena, The White Woman's Other Burden (Routledge, 1995), 128. ↑ Blavatsky, H. P. (1889). ↑ Wessinger, Catherine Lowman (1988). ↑ Lutyens pp. 276–278, 285. ↑ Gopal, Madan (1990). K.S. Gautam, ed. India through the ages. Publication Division, Ministry of Information and Broadcasting, Government of India. p. 192. ↑ Jennifer S. Uglow, Maggy Hendry, The Northeastern Dictionary of Women's Biography (Northeastern University, 1999). ↑ Lutyens pp. 236, 278–280. 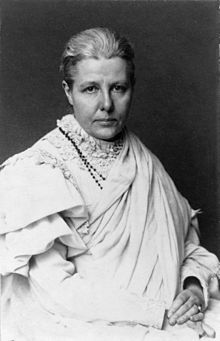 ↑ "Mrs. Annie Besant, 84, Is Gravely Ill in India. Leader of Theosophists Says Work in This Life Is Done, but Promises to Return". Associated Press in the New York Times. 6 November 1931. Retrieved 14 February 2014. 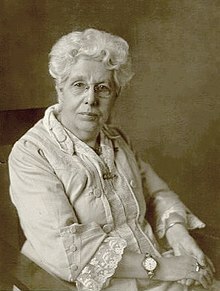 Mrs. Annie Besant, 84-year-old Theosophist, is so ill, it was learned today, that she is unable to take nourishment. 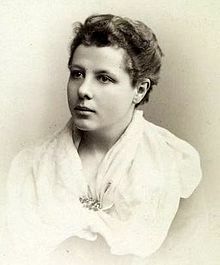 ↑ "Annie Besant Cremated. Theosophist Leader's Body Put on Pyre on River Bank in India". The New York Times. 22 September 1933. Retrieved 14 February 2014. ↑ The Political Status of Women (1874) was Besant's first public lecture. Thought power, its control and culture Cornell University Library Historical Monographs Collection.